I think it’s safe to say that democracy is a work in progress. So, as we celebrate the 4th of July, let’s really get this party started shall we. A true celebration means recommitting ourselves to the work that needs doing if we want democracy to survive and thrive. This excludes just sitting in the house and “liking” a democracy page on Facebook. We have a responsibility to be accountable to everyone around us…The Common Good. We spend so much of our time divided these days, defining ourselves by our “side” that we forget something very important and frankly it’s in grave danger: We’re all in this together! Sound familiar? That’s right, it’s because you’ve heard this many times before in a wonderful document that seems to be getting some attention these days … The Constitution. We the People of the United States, in Order to form a more perfect Union, establish Justice, insure domestic Tranquility, provide for the common defence, promote the general Welfare, and secure the Blessings of Liberty to ourselves and our Posterity, do ordain and establish this Constitution for the United States of America. Everything after this sentence is just sugar on that big ole piece of pie. So, today as we celebrate our Independence, let’s try to re-think how we start tomorrow. I’m suggesting an Interdependence way of thinking for the rest of the year. I love my freedom, but I’m also a big believer in collaboration. A small group of thoughtful people could change the world; indeed it’s the only thing that ever has. Margaret Mead. I know for me, in my personal life, I wouldn’t be where I am today without all those helping hands along the way who took the time to invest in my wellbeing. There were many times when energy and love were thrown onto my path to push me along. Of course we would all love to take credit for our achievements, but let’s face it … it was a communal effort. We tend to forget that many of our opportunities came from the hard work of the generations before us who cared enough about our future to invest in the common good. Where would we be without it? 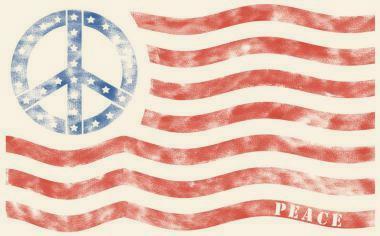 Let’s celebrate our Independence and our Interdependence today by being free from our hatred, fears and differences. These are the real freedoms that lay out a strong foundation for our future. Now, I’m not going to lie, I will have to remember this when my beer induced, wanna be pyrotechnic neighbor starts setting off fireworks from his weather-beaten, one spark short of an inferno deck this evening. I NEVER SAID IT WAS GOING TO BE EASY…nothing worthwhile is ever easy. It doesn’t matter whether you’re gathered around embracing your freedom with friends & family or just enjoying an extra day away from the salt mines work place, you can take a moment to focus on the similarities of your surroundings. Hey look we both breathe air Omg! we have so much in common. We have to start somewhere now…right? Enjoy the Ride! Sometimes I think they’e set in cement and then someone surprises me with hope…I have to hold onto that piece. If I loose my hope, I’ll loose everything. Thank you! Imagine is my theme song…it’s so easy, why does it have to be so hard? Very nice piece. As you say we can appreciate our independence while recognizing our interdependence. I wish our politicians would have the courage w/the long term in mind while recognizing neither side will get all it wants. Thank you! It certainly would make our lives a heck of a lot better if a big lightbulb went off in all those elected heads. Yes, it would but let’s not count on it happening. Well said by a true optimist! Very cool about Imagine. And, to think Lennon was on Nixon’s enemy list. That speaks volumes about how right and profound the former was and how petty and small the latter was. Well said, I liked the line about the ‘sugar’. It was nice you were flying this particular flag when in the Supermarket Aisle recently, Lisa. I hope New Chester survived your neighbors celebration. What a great idea! I like the term Interdepence, we need something to pull this country back together. But does your plan include taking Fox News off the air? They’re one of the main culprits in this campaign to pull us apart. Sometimes it is easy to forget how many people have helped us along the way. Thanks for the lovely reminder. Such an optimistic view. We need more of that. Great post. Hope you had a great July 4th!